I was reliving childhood memories with an old buddy and we got onto our diet as kids. 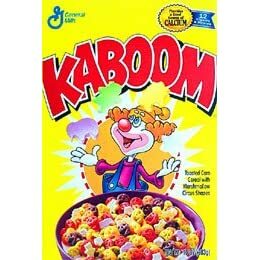 One of the staples in my home was the breakfast cereal known as Kaboom. As I recall, Kaboom was kind of like Fruit Loops with marshmallows and giant chunks of refined sugar mixed in. We didn’t eat it by the bowl... we ate it by the box. The last time I ate a bowl of that cereal, I remember my stomach started flipping asynchronously with my brain... and it was like that scene in The Matrix where Neo realizes that he is on the Nebuchadnezzar and hurls all over the deck. Thus, the cereal was appropriately named... although if it were still on the market, I think there would be one of those Surgeon General warnings that eating this cereal could cause a Diabetic Coma. Whoops... what do you know? It is still on sale. Grab your insulin needle and have a bowl... or three!